Gaetano Donizetti. Very Good. In very good packaging. 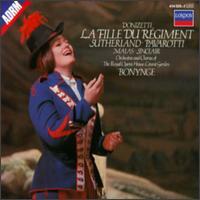 Luciano Pavarotti-Donizetti: La Fille du régiment by Luciano Pavarotti. Very Good. CD'S in very good condition, almost like new. Booklet included. FREE UPGRADE TO FIRST CLASS SHIPPING. Very Good. Tested before shipment, complete 2 disc set, Each order is emailed a USPS tracking number. All books are sanitized and cleaned for your protection before mailing. Fine. 028941452023 Perfect except not sealed. Ask about discounted shipping available when multiple items are purchased at the same time FAST, RELIABLE, GUARANTEED and happily SHIPPED WITHIN 1 BUSINESS DAY! New. 028941452023 New with original packaging intact. We ship in recyclable American-made mailers. 100% money-back guarantee on all orders. Fine. 028941452023 Disc, case and artwork in excellent condition with little sign of use. May not include online digital copy. We ship in recyclable American-made mailers. 100% money-back guarantee on all orders. New in new packaging. 2 discs. Originally released: 1986. Libretto included.